You rely on your home’s hot water heater for a lot – cooking, cleaning, dishwashing, laundry, and personal hygiene – so when it fails, it can cause a major disruption to your household routine. 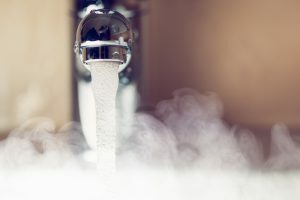 Many homeowners don’t know there’s anything amiss with their hot water heater until it fails, and that can be an inconvenient, expensive venture. But if you know the signs of hot water heater failure, you can get ahead of it – and keep the hot water flowing in your home. Age of Water Heater: Knowing the age of your water heater is important. If you’re not sure, you can generally check by the equipment’s serial number on the manufacturer’s website. Or, your plumbing technician will be happy to help you. If you find that your water heater is 10 years old or more, it’s likely time to consider a replacement. When hot water heaters reach this age, the potential for leaks becomes much greater – and that can cause extensive damage to your home. Dirty Water: Noticing rust when you run your hot water? This could be a good sign that your water heater tank is rusting on the inside. If you’re concerned it might be your pipes, try draining a few buckets of water directly from the heater. If it’s still rusty, then you likely need to replace your hot water heater soon. Noisy Operation: Water naturally has minerals and other sedimentary particles that will, over time, gather in the bottom of your hot water heater tank. Heating the sediment will over time cause it to harden. The hardened layer of sediment can cause your hot water heater to lose efficiency, and cause wear and tear on the tank that can lead to leaks. The giveaway that you have a layer of sediment in your tank are banging or rumbling sounds during heat-up. Moisture Around Tank: Moisture around the tank of your hot water heater can indicate a leak or a fracture. After checking other pipes, connections and fittings to make sure they’re not leaking, if you still notice water you probably need to replace your hot water heater. Time to replace? Give Family Danz a call – we can help meet all your hot water heater needs. Family Danz is ready to help you if you need a new water heater. We have many options available, and our expert plumbers can install your new system quickly, so you won’t have to worry about being without hot water in your home for long. Just give us a call at 518.427.8685 and we’ll help you explore your options and find the right hot water heater for your home and lifestyle needs. We’ve all been there. Just a couple of minutes into enjoying a steamy shower, then – the hot water disappears. And… the rest of the shower is spent under a Nordic waterfall! Nobody likes running out of hot water, but did you know you don’t have to? Tankless water heaters heat water on demand, rather than heating a whole tank of water, so you can count on a hot shower every time! Even more importantly, though, a tankless hot water heater can help you save energy – and money on your utility bills. Endless Hot Water: As mentioned above, tankless water heaters only heat the water you need as you’re using it. So you won’t have to wait for a tank of water to heat up. Space Saving: You won’t have a large water tank taking up space in your home when you go tankless; these water heaters are small and wall-mounted. There are even models designed for outdoor installation. Energy Savings: Tankless water heaters are efficient, and can save the average family of four nearly $100 a year compared to a gas storage water heater. And, the more efficient the model you choose, the greater the savings – choosing an ENERGY STAR certified model can save you an additional $20 a year. If you live in Albany, Schenectady, Saratoga or the surrounding areas and need to choose a tankless water heater for your home, give Family Danz a call at (518) 427-8685. We’ll tell you about the different tankless water heater products and services we offer, and help you find the solution that best suits your needs.